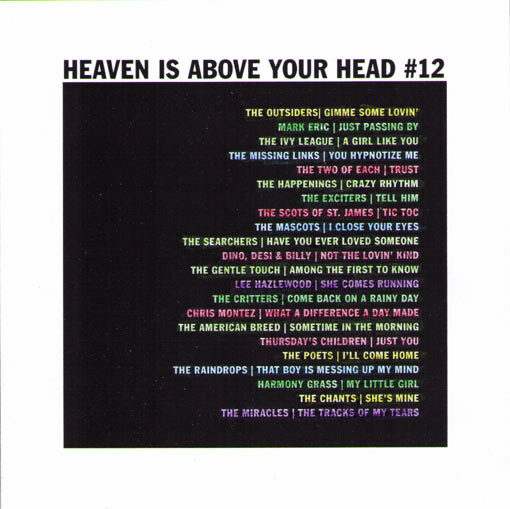 Heaven Is Above Your Head was a weekly radio show and podcast while I was living in New Zealand. For the second hour of every show my friends and I would all play exactly what we wanted and maybe have a dance. They have kept the slot and you can now listen to Simply Thrilled every Saturday on non-commercial station Fleet FM, at 9pm local time or 9am GMT. If you happen to miss it they usually post a link on the Anorak forum afterwards. The previous episodes of HIAYH can all be found on my blog. So the theme for this is 60s music, but avoiding the collectors scenes of garage and northern soul. What I ended up with was this great set of soft pop, haunted by the spirit of the Pye and Immediate labels. I was going to make it like an ordinary radio show at first, with spoken links, cause I felt I had a lot to say about the songs at the time. That was a couple of months ago though, so now I just mixed them together as they are. I hope you will appreciate the blending of some proper hits with more obscure would-be hits. Like the British group Thursday's Children who only released one single in 1965. And "Among the First to Know" which is one of my all-time faves, and has been covered by The Happy Balloon. The Mascots was a Swedish Hollies-styled group, here showing off their freakbeat side with a track from their great and only lp EELPEE. The American Breed had a couple of hits, but this string-laden ballad can't keep me from thinking of Belle & Sebastian. The Chants are notable for being a black vocal group from Liverpool, whose live debut took place in 1962 with The Beatles backing them. Read their story here! The group The Missing Links here is not the Australian one, but an American with one single to their name. Harmony Grass was a late 60s mutation of the Beach Boys-influenced Tony Rivers & the Castaways. And The Raindrops was of course the pseudonym used by the late great Ellie Greenwich and Jeff Barry for their own recordings. Enough talk.